WHITE LATEX LIQUID® is formulated for use with DEPENDABLE WHITE SKIMCOAT™ Underlayment, it provides greater adhesion, water resistance, flexibility and mildewcide protection. It may be used as an additive with SKIMCRETE® XL and other DEPENDABLE trowelable products wherever a non re-emulsifiable latex primer or additive is required. It also may be used as a primer over textured or smooth metal surfaces, adhesive residues, or under leveling products used in exterior applications under certain circumstances in accordance with specific instructions. After preparing the surface, use a clean mixing bucket and implements adding measured powder into measured liquid. Do not floor mix, use a piece of sheet vinyl or mixing bucket. Leftover residue can accelerate the chemical reaction and/or reduce working time of new mix. Mix to a lump-free trowelable consistency. Follow printed mixing ratios of the appropriate Dependable Floor Underlayment product. Metal surfaces: Remove any rust or contaminates. Wash and allow to dry completely. Apply a brush-coat of WHITE LATEX LIQUID®. Allow to nearly dry and become tacky. 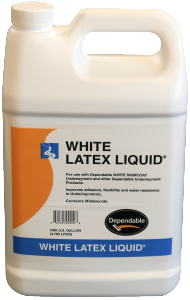 DEPENDABLE WHITE LATEX LIQUID® may be used to prime porous substrates for floor covering installation. Application rate will vary depending upon the substrate’s porosity, but should be 150-250 SF/gallon. Allow to dry, usually 1-2 hours, and then begin adhesive application. The installer may wish to seal the joints, hammer-indents and any other “raw” spots with DEPENDABLE WHITE LATEX LIQUID®. This will keep the moisture in the patch material and/or adhesive from being drawn into the board, which may cause swelling and/or delamination. Freeze-thaw stable: If frozen, allow to thaw at room temperature of 70ºF. Stir. If smooth, then latex should be safe to use. Keep container closed when not in use. If taken internally, call physician and treat for ingestion of latex. KEEP OUT OF THE REACH OF CHILDREN.